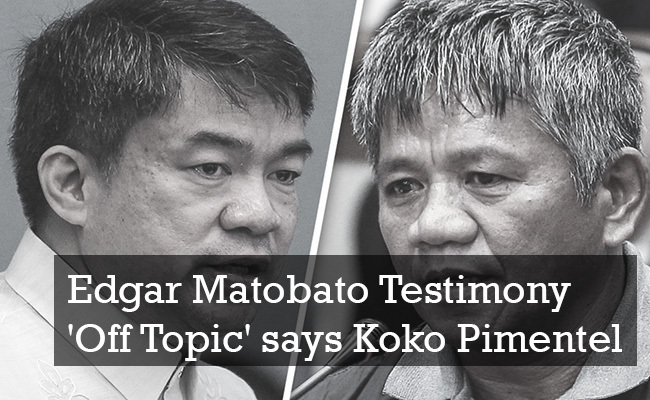 It would be the end of scrutinizing the statements of Edgar Matobato if only for Senate President Aquilino "Koko" Pimentel III. According to Senator Pimentel, a new resolution should be done before the senate could move further in investigating the testimonies of self-proclaimed hitman Matobato. The latter has been accusing President Rodrigo Duterte of being the mastermind of the Davao killings of known criminals. Pimentel stated that he would relay this to Senator Leila De Lima due to the fact that the Senate committee on justice and human rights had deviated from its original objective after hearing the presented witness' testimony implicating the President. The said committee is being chaired by Senator De Lima is investigating the recent increase of killings of drug suspects amidst the government war against illegal drugs. Senate President Pimentel has earlier rejected De Lima's request on protective custody for Matobato, citing that the witness was not important in the eyes of the Senate because he was testifying on matters that allegedly happned from 1988 to 2013.